Renko charts are used for alternate price charting. Unlike the usual time framed chart – where every candle represents a fixed time interval – the goal of the Renko chart is expressing price movement in levels, called bricks. Including precise, tick-based testing (aka 99% testing model quality). See Renko FXT Builder for more details. Limits may apply. Watch the video to learn how to install and use Renko. The Hybrid Renko modification does not allow creation of a new brick until specified tick volume and/or time duration is finally exceeded. It can control parameters directly from the offline chart. You may download, install and combine the generator files, they are treated to be single product with a single license. and where can i take licance key? Hello Serkan, please click the Pricing & Order item in the top menu. If you notice the ad at the very bottom of the page, you may get the discounted price with Spartan Traders, in case you are their student. Please search for the discount link in their students’ zone. I have the Renko charting with Spartan. I have also used test helper for renko which works well. The problem I’m having is that I can’t get enough bars on the chart to back test on the 3 pips per box settings. Is there something I can do to get more bars. Thanks Chris. Unfortunately I do not have knowledge about emulators. Please contact me using Contact Form with more detailed description. Hello Thierry, the usual way is attaching the expert to the generated Renko chart. It would work well with both the trial and the licensed indicators. Including indicator into the expert is quite advanced task and it needs a reason. what I’m really intrested in is the lines of codes required to obtain the renko bar ( high low open clode ) for any target bar. How is that performed ? For example if i place my ea on the generated renko chart what lines of code would my ea require to access the the high low open close of a generated renko bar.? Concerning backtesting is it possible to backtest with the renko bar indicator…? I downloaded the meanrenko indicator and copied it to my latest version of mt4 duely. Opened data folder from files, opened mql4 folder, and copied into the indicators folder. And i have allowed dll inputs as well. However the mean renko indicator is not working and i’m getting a msg like “indicator cannot create this offline chart, try to set other offline tf in the input”. I tried to set m2 and m3 timeframe but it still gives the same error. I tried to use the indicator with my previous built mt4 broker and it works fine in my not updated mt4 terminal broker. Hello Mehmet, in case there are problems to select the offline timeframe though you checked other offline generators do not use it, then restart the Terminal. It might be some lost script blocking the file handle. Would it be possible to add the following features to the indicator: audio alerts every time a new bar is added and be able to activate and deactivated ? Hello Thierry, for an acoustic signal watching for a new bar you can use any of numerous dedicated indicators placed directly on the offline chat. I see that you are selling Omni bar 3 user licence for $ 120. I only have one laptop. How much is it for only 1 licence? Hello SK, a single license cost is $120. You can use it on up to 3 computers. Do your renko or median renko indicator use too memory or too much resources and slow down PC/laptop? Probably yes, it depends on the length of history of the other timeframes, as MT4 duplicates history buffers during calculations. Hello can you explaine us how the volume is calculated per renko bar( let say 100pips renko bar)? Hello Silviu, they are called phantom bars, they traverse gaps where no tick exists. I finished my trail period and I have a license key. how do I enter it to activate the indicator again? Hello, is it possible to use downloaded tick data to generate renko chart with your indicator instead of using M1 history? I imagine that I run an empty ExpertAdvisor in startegy tester on downloaded tick data. I would drop your indicator on the chart. If the indicator is able to generate chart with standard time frame (for example M5) than I would be able to backtest my real EA on that chart. Hello Luna, unfortunately it is not possible. Accessing the history files from the Strategy Tester is restricted (to eliminate fraudulent test results). For using the tick data in a live environment – it could work, but you needed the tick data from your broker. The generator uses only such tick data, which match the M1 timeframe. If you had such proper broker tick data, I could build a script generating the tick file for live environment (for the chart model builder). your charts look great. is there an option to use ATR to determine the brick size? or will it be in the updates in the near future? I am totally happy with the renko indicator I bought from you. The reason for this is that I have great passion with trading renko. I tried all free renko indicators and I wanted to open many charts looking for the best setup. I always had an issue with MT4 freezing. It was frustrating until I tried the free version of yours and then I bought the license. It helped me a lot in refining my strategies and Iam glad to say that today is the first day of trading live. I love the idea of have three sub-windows for different renko settings. It just makes my life easier and trading enjoyable. I even tried the MTF indicators with different renko box sizes. I can easily call the offline charts like M2 M3 M6 etc and get a reading for Multiple Brick Size. Hello. I have same problem. However the mean renko indicator is not working and i’m getting a msg like “indicator cannot create this offline chart, try to set other offline tf in the input”. I tried to set m2 and m3 timeframe but it still gives the same error. Hello Alex, sorry for late answer, but I did not know what the reason was. Currently the possible reason emerged. Though I have not yet received full confirmation, it looks like some non-ASCII characters in user profile name (the folder of the current user under the C:\Users\) result in incorrect evaluation of the MT4 data path and the indicator fails to locate the proper data locations. However it does not affect only my indicators, but also other MT4 behaviour. If you want to test if this was your case, please create a new user whose name has only ASCII characters, and try to test the MT4 there. (You may remove the user after the test). Quick question, I have the latest version of the Renko’s, however the offline chart shows M16423. Is that correct if I want a 15 minute chart, etc.? How do you ensure the timeframe on the offline chart matches what you want, i.e. would like to look at 15 min and say 30 minute chart? Just want to ensure that I am looking at the correct time frame on the offline chart. The offline chart receives pure random number if you leave the entry blank in the Inputs tab. I would recommend to fill it, the random number may get altered in some conditions, and then your original offline chart becomes an orphan. In addition, this number determines a period separator (daily, weekly, monthly and yearly). On the other hand this number has no effect on candlesticks, the generated chart has the same shape on any offline timeframe. I recently purchased RenkoBar License Key. Prior to using OVO Renko Bar Indicator I had struggled with creating Renko Charts using such Products as Renko Live Charts, Renko Bar Charts EA and several others. The main problem with all these EA’s and Indicators was that there never was enough history to create a functioning Off Line Chart. I was constantly trying to add history to make the off line charts function so that I could trade them. OVO Renko Bar Indicator is absolute genius! OVO Renko Bar Indicator si far superior to any other Renko Chart creation tool on the Internet. OVO Renko Bar Indicator is terrific value. I have an intense interest in understanding the value of adding Renko Auto Range to my Off LIne Charts. There is little or no information on the Internet about the value of trading with Renko Bars that are created with a range for actual bar size as opposed to an arbitrary bar size. I respectfully request that you place more information about the significance of Trading with a Renko Chart based upon a Renko Auto Range Bar on your Website. I have a gut feel that it is very important. Any Trader that is considering trading with Renko can not do any better than to create his/her charts with OVO Renko Bar Indicator. So many renko bar variations on this site. What is the best one for trading? I am confused which one to choose … pro renko bars , mid renko or other renkos on this site. Hello Andy, there are three indicators on this page, the two of them are Renko and differ only in wicks, the third one is a mod for experienced traders, not suitable for common Renko strategies. You may use them all concurrently with the single key. Hello Tari, please use the contact form when requesting support. Hello Abdulah, you may use all Renko indicators on this page concurrently with a single license. Regarding special prices, they are available only to bulk buyers (3+ licenses of the same kind), for a single license you need to go to the Pricing&Order menu and pick the “Pay Now” button under the desired produce type. Thank you, enjoy. Do not forget the Renko FXT Builder raises its limit to 10k bars once your RenkoBar license is activated. Hi, is there an indicator that generate hybric renko chart where all open price follow the previous bar close price? Thus the reverse direction renko bar is a double barsize as compared with normal renko barsize. Thanks. Hello Lee, this option is available for the Flex Renko chart, which is included in the OmniaBar indicator. You can have the Renko chart with setting 100/100 input values for the Flex Renko. Is the payment for the licensing of the products a one time fee? Yes, it is a permanent license. Awesome! Can I also add it to other machines such as a laptop? I am using my desktop at the moment but I would like to use this on my laptop as well. Sorry please disregard that last question as it is stated on the pricing section of the website. I currently have downloaded the MeanRenko Bar indicator; If I were to just need the key for that renko system I would have to purchase the Mean Renko Key only, is that correct? The key for mean Renko is valid for the mean Renko indicator. It also increases automatically the limit number of candles generated by the Mean Renko Fxt Builder to 10k on a computer with that license. he does not show the period separators. change the offline ID in the inputs to less than 240. What does the SESS button do? It restarts the chart generator with every time gap, i.e it does not continue with the last candle from yesterday, but rather starts a new one at the today’s open price. For the RenkoNoWickBar you may use the RenkoBar or OmniaBar licenses. With the license for RenkoBar, you will be able to run RenkoBar, RenkoNoWickBar, RenkoHybridBar in unlimited number of copies on three computers, lifetime. You may pick other three computers in case you needed to leave or retire the hardware or reinstall the system. If Metatrader closes down MT4 and only makes MT5 available do we have to purchase a new product or will you provide an upgrade. Would there be any cost for this? I have no option for the MT5, until Metaquotes implement custom charts in MT5 terminal. However, there are no messages about “closing down”, as far as I am informed. They still sell MT4 server licenses. Im looking to have an EA programmed to trade off this indicator. Would it be possible for a programmer to make an EA simply based on the block color changes (ie 2 blue blocks buy long then 2 red blocks exit long position and enter short and so on ) if so what information would they need? Do you recommend any programmers? Do this sale provided the mq4 and ex4 file formats? and lastly Do you provide updates for your software when and if metatrader 4 “updates” again? Yes, that should be piece of a cake for a programmer to create such a simple EA. Unfortunately I cannot help with the recommendation, I do not have knowledge of how the other coders perform. No, I do not sell any mq4 files. When the MQL4 updates and an incompatibility appears, I usually already have the new version, or I would publish a workaround when the incompatibility is behind the MQL language scope. I need a coder to but i contacted my usual one & he said he could not code a ea for any renko generator here onovo so i guess the buffers are not available, this is necessary to code a ea in ex4 formatt…I asked this question specifically below & omniabar but i have not received a reply yet…I also asked anothed coder to look into it so when he gets back to me i will let you know his reply & put him in contact with you if it is possible, but i cannot guarantee the quality of his work as i have not worked with him before but he did try to help me with the problem at hand so he might be ok & he does have experience in mt4 coding. Joseph look at my post below by “Robert” i have found a coder that says he can code a EA for OmniaBar & Renko, if you still need a EA coded let me know & i will put him in contact with you after my EA is done just to make sure that both of us do not wast our Time & Money. Joseph read my Post below by “Robert” sorry for the confusion but this forum/blog does not work as usual. I was able to fing 2 coders that could code a EA for any Renko product here…The trouble in finding a coder is that it requires a more experienced coder…I actually had a coder do a EA for me using OmniaBar so this is the 1 i would recommend but if needed i will put you in touch with both if you still need one, or anyone else here, just post & i`ll get back to you asap. I am a member of the spartan trader academy and been told to get in contact with you to order a discounted key for the ovo renko license . Hello beranger, you may get the discounted price with Spartan Traders, in case you are their student. Please search for the discount link in their students’ zone. I like your offline tester but I tried today after a long time again. I am using 1000 Bars for creating the Renko’s but after dragging the offline tester in the chart I only see a few Bars (5). Where are my other Bars which I had in the original Renko Chart??? Hello Jilles, I checked the script with a few new builds and all seem to carry all the candles, except the phantom bars. It never expires, and it never gets consumed. You may even transfer it from one computer to any other computer. Hello eugene, the remote is a free addition. There is no limit on brokers or accounts, the only limit is number of computers (or Windows user accounts if deployed on more than one Windows user). Paypal is listed in Malaysia, so no problem should arise with payment. ok, that mean if i purchase the renko and mean renko ativation key it came with the omnia remote control, and also i can use those software on 3 computers(3 operating windows 10) rite…. Correct. The OmniaRemote has no restriction. Just consider that $90 is quite close to $120 for the OmniaBar, and you would have them all. Omnia Bar is a single indicator, which can construct any of the charts presented in this site. Check the main menu – Products->Omnia Bar. i downloaded the trial file.. and loaded it to mt4 chart.. m1.. open offline m2.. but nothing.. just the basic offline lines.. is there a tpl available? If i creat 2 or more charts with different time frames 2-m & 7-m etc. will all the charts up-date at the same time so they can be used simultainusly for trading? Do i need something else to up-date all charts in real time / simultainusly? If not why don`t you add this feature in future version / update. To clarify, i can use this on 3-different computers [ home pc + vps ] with unlimited instals of the indicator,correct? What if something happens and i need to change the 3- computers, is it possible w/o any further purchase? Robert, the answer is yes to all your questions. Are the renko buffers available so a ea could be developed for it? I am sorry, the indicator does not use any buffers. I am unable to download for my windows laptop, it keeps downloading in the wrong type of format, is there another way I can download? Hi Milan, what other payment method can I use as I don’t have a PayPal account? I simply love you Renko products. I do not have and do not plan to open PayPAL account .. is there any other way to pay .. credit/bank card etc. .. I want to buy either RENKO alone or the entire OMNIA package. I am interested in Renko and like to buy $45 package. I have already downloaded some files but not sure which files to be downloaded. Kindly help me to choose the essential files. Which video should I follow? Is there any PDF user guide? The only essential file is any of the indicators displayed in the upper right corner of this page (you may take them all). For information about the optional stuff you may watch the video above and download them from the general Download page. I can’t find the renko mien indicator anywhere. Are you still selling this as a separate indicator or is it part of one of the inicator packages on your site? Hello Russky, not sure what you meant exactly. There is the mean Renko indicator available in the site, however there is no indicator displaying Renko in a separate subwindow (if this was the point). After testing the strategy, I had 80% efficiency. On a demo / real account it is 40-50% ?! Is there any chance for effective testing of syrategy? I suppose you are talking about the Renko FXT Builder, though we are in the Renko generator page. Not sure what you exactly call “efficiency”, but 45% gain in comparison to 80% is quite a big difference. My blind guess is the trades in the tester exactly correlate with the live ones by 95%, and the rest may suffer from slippage or may get skipped if broker does not accept them. So please check, if you set the spread realistically in your Strategy Tester, no idea what else could cause it. How can I test the strategy RENKO with the correct spread? Hello Patrik, this query is not relevant to this page, but there are a few brokers with history including the spread, check the data sources in FXT Builder help page. before I am starting with the help, please be sure you tried the license reset and you filled the license code back correctly. Please how can I get your skrill account to pay for a renko bar indicator? Thank you. Before Skrill payment use the contact form, please. I’ve set 100000 candles to starts with in the settings of renko. So why it does not work? Hello Wojtek, scratch the USDJPY history files (*.hst) – in [data folder]/history/[server]/ folder. They should be erased when the terminal is shut down. 100000 candles may take a while then. How is m2,m3.m4 renko calculated? How is this candles formed base on m2,m3 and what is the difference? I understand that per candle is by brick in terms of pips. and some program it differently. What license should I buy for renko wicked renko bricks? Is This license also serves for original renko and hybrid too? You need the Renko license. Indicators listed in the top-right corner of this page are covered by this license. The PonitO indicator is not. Is it necessary to buy these indicators? and if without them, will the median renko bars work? Those indicators are free additions, and they are not required for creating the offline chart. Pls advise me which is better to trade, renko or range bar? I cannot trade Renko myself, while rangebars are my favourite. However Renko is far more popular. Is it possible to access multiple time frames of the renko bars from an EA? For example, monitor both a 4 renko and 6 renko chart from a single EA? Yes, in the live operation you may address any offline chart quotes, supposing the chart has its window in the terminal (may be in minimised view). It is not applicable in the tester, though. Pho, thank you for all your compliments. I am happy if my work helps you. How can I draw Renkobars with the Open ‘fixed’, as it is fixed per the option in the OfflineTestHelper? Thanks for letting me know. You can’t. The option is using the OmniaBar’s Flex Renko instead, which has this option built in. I bought renko for you. Can I using it also mt5 ? I do not think any MT4 indicator can be used in MT5. MT5 is a different platform. hi, ive been using multiple different indicators of renko and they keep repainting swings once i refresh the chart. is this normal? if not can you guarantee that your renko indicator does not repaint the way these other fake ones have been doing. Hello Radley, I do not know how other Renko indicators are constructed exactly, I guess they mostly interpolate candles of the current chart for the initial chart reconstruction. In such case such behaviour would be normal. Regarding the guarantee, a general disclaimer of responsibility applies. I cant download any program, is there a problem with the page? It does not seem like there is a problem with any download. can you sell the source code file also? Any limitations in using your indicators on a Mac book? Hi, testing your products really impressed. My question and might have been asked before.Is it ok to put other indicators on the offline chart. The only confusion I see is switching back to original chart say on 15 minutes.So should one make the offline chart 15 minutes.Just learning Renko, always used Heiken Ashi. Thanks again for the development you have done. Tried doing codes for MT4 bloody hard. Indicators attached to offline charts keep refreshing all values with every tick if they are not developed with respect to offline charts (which is quite rare). So essential need is setting the offline chart short and avoid redundant indicators, if you intend to decrease the power drain. The original chart (the chart with a generator) may change its timeframe, it has no impact on the offline chart. Are renko w/o wick and wicked renko have repainting characteristic or is pure non repaint? 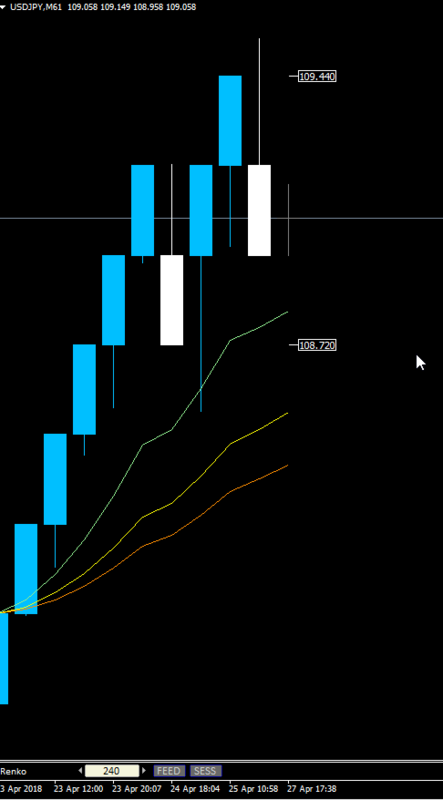 Second, I can see no difference in charts when I set different time frames like m2 m5 m15 in renko wicked and no wick. Is the time factor really don’t matter in these two renko charts or else? Hello Majid, not sure what characteristics you mean, but the offline chart does not repaint on chart reload. Still, it may trim the left chart part according to the setting of initial candles condition, or redraw after missing data arrives. Regarding the timeframes, I cannot see the difference either, I believe it is how it should behave.